As professional Video to iPod Converter, 4Easysoft iPod Video Converter provides an easy and completed way to convert video to iPod from all popular video formats. It can convert video/audio formats such as MPEG, VOB, MP4, M4V, QuickTime, etc, for iPod/iPhone and convert AVI to MP3, AAC, M4A for iPod. 4Easysoft iPod Video Converter has rich video for iPod converter functions to vary output files such as splitting file by preset time-length, personalize video by adding watermark, outputting with exact file to fit for your iPod, and so on. This iPod Video Converter supports iPod touch 4, iPhone 4 and iOS 4. 4Easysoft iPod Video Converter can be used for all the iPod/iPhone models: iPod, iPod touch, iPod touch 2, iPod touch 3, iPod touch 4, iPod nano, iPod nano 4, iPod classic, iPhone, iPhone 3G, iPhone 3GS, iPhone 4, iPad, Apple TV, PSP, PS3. 4Easysoft iPod Video Converter allows you to set the video Brightness, Contrast, Saturation. Checking Deinterlacing helps you to convert interlaced video to the progressive video, this function can optimize the video effect. Merge several interesting clips into one then enjoy videos on iPod unremittingly. Remove the black sides by cropping video to only keep the real video part with this iPod to Video Converter. 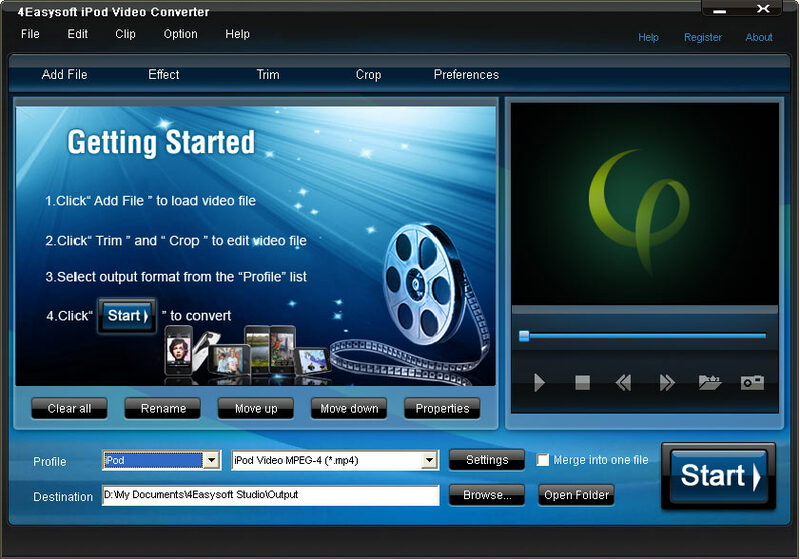 Preview movies while editing for you to get the best movie effects. Whether you are an experienced user or a beginner, 4Easysoft iPod Video Converter will convert video to iPod, convert AVI to iPod and transfer MP4 Video to iPod/iPhone in a breeze! Get different output formats from source file and convert one by one successively. How to put video on iPod/iPhone/PSP?